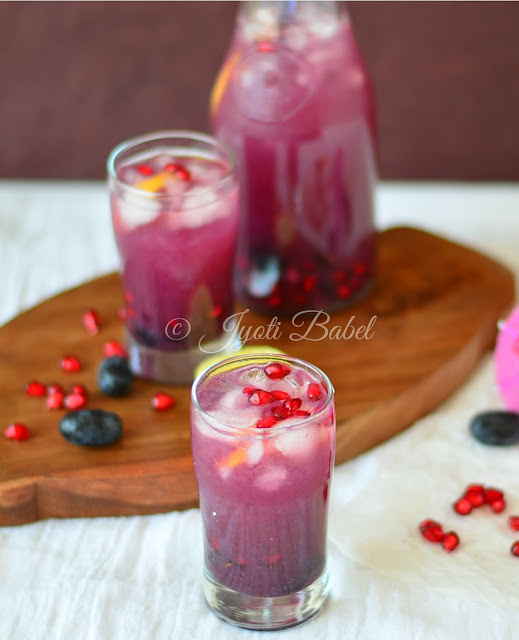 Purple Delight is a summer cooler drink made with fresh grapes and pomegranate juice. It is spiced with pepper powder, roasted cumin powder and black salt. Fresh and tangy, it is just perfect to keep you cool during summers. Colours are an important spice of life. Imagine your life without colours – boring right? I believe it is the same with our food – it should be colourful and pleasing to eyes. When I was thinking about all the cool drinks I was indulging in this summer, I realized they were all of the different colours. My Kairi Panna is a soothing shade of green as I use a lot of mint in it; the Masala Chaas is, as usual, white, my Herbal Iced Tea was a bright shade between orange and brown. That’s when I thought of creating a different coloured drink to sip on. I had lots of black grapes and pomegranate in my refrigerator and with these two star ingredients; I set on to make a drink. When I was done, I was pleased with the result at hand, so much so that I took it to a friend’s place for her to taste. She has become my unannounced official taster for most experiments in my kitchen. 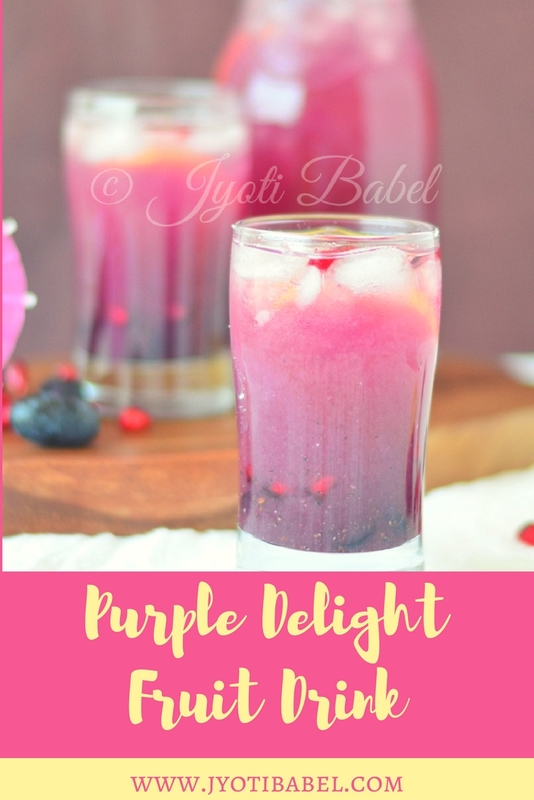 When she okay-ed it, I made it again the next day and while sipping on it, this name – Purple Delight came to my mind. The other day when I met her and amidst our usual banter, I told her I have named the drink – Purple Delight and she was into a riot of laughter.... which reminds me of another spice of life - laughter. Laugh as often as you can and be with friends who can make you laugh out loud. The pomegranate juice typically has a slightly bitter note in the end which compliments beautifully with grapes juice which is sweeter. A dash of lemon juice adds a subtle tang to the overall flavour and the spices add some earthiness. If you want to try something different from your regular lemonade, try it for sure. 1. 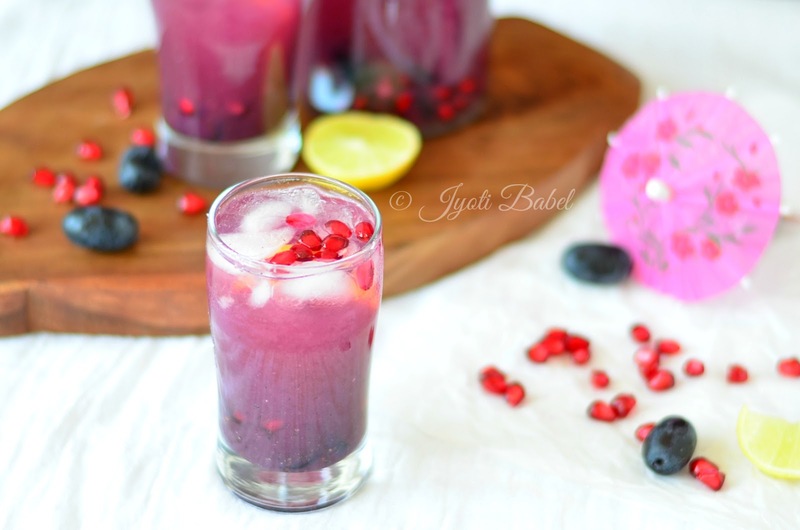 In a blender jar add the grapes and pomegranate pearls and churn till pulpy. Sieve the mixture to extract the juice. 2. Add the juice to a large jar; add sugar syrup, black salt, black pepper and jeera powder. Stir well. Add this to 4 medium glasses. 3. Add some ice cubes to each glass. Top up with soda water. Garnish with chopped grapes and pomegranate pearls. Serve chilled. 1. The black grapes I used were quite sweet. If you are using grapes that are tart, adjust sugar syrup quantity accordingly. 2. It is best to consume it fresh and chilled. Awesome drink it is. Actually a delight. Had a chance to have it and even my kids loved it. Click is awesome dear.... beauty for eyes. awesome drink for this killing summmer. I am going to make it now.